This high affinity facial mask with the fiber of TENCEL® contains vital mineral essence with intensive purifying property. HY+3 Aqua-Channeling Factor and Perfect-Hydration 24 Complex provide essential nourishment and moisture to skin. Regenerating Mineral Complex deeply replenishes minerals for skin health and awakens skin vitality from deep within. 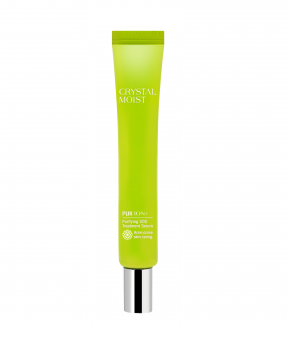 Specially formulated with PURIgreen Complex™, it helps purify, soothe and reinforce skin barrier. Unique Willowbark extract contains naturally derived Salicylic acid-like ingredient, containing anti-bacterial property to improve overall skin complexion. Together with Portulaca Oleracea extract from Korea and Edelweiss extract, it helps provide antioxidant and soothing benefits. Suitable for acne-prone skin. Skin is smoothed and refreshed after use. Pure and natural cellulose fiber TENCEL® empowers a superior moisture retention power, it fits well on face contour to provide intensive moisturising and soothing effects for a crystal-pure complexion.